At Waterstons we love our hack days! It’s a great opportunity to escape the everyday and completely immerse ourselves in our passion for creating solutions to all types of problems using technology. Hack days enable teams to bond, bounce concepts off each other, and sometimes from the truly wacky, bright ideas are born. In fact we love our hack days so much we thought it’d be a great idea to invite some of our brilliant customers along to share in the experience with us. We asked them to come along armed with a problem they’d been wrestling with, but never had the chance to properly explore, to see if we could come up with a solution in a day. OK… so there were some discussions prior to the day and we never promised them a finished, boxed, off-the-shelf solution they could walk away with, but we managed to create some pretty good working prototypes. 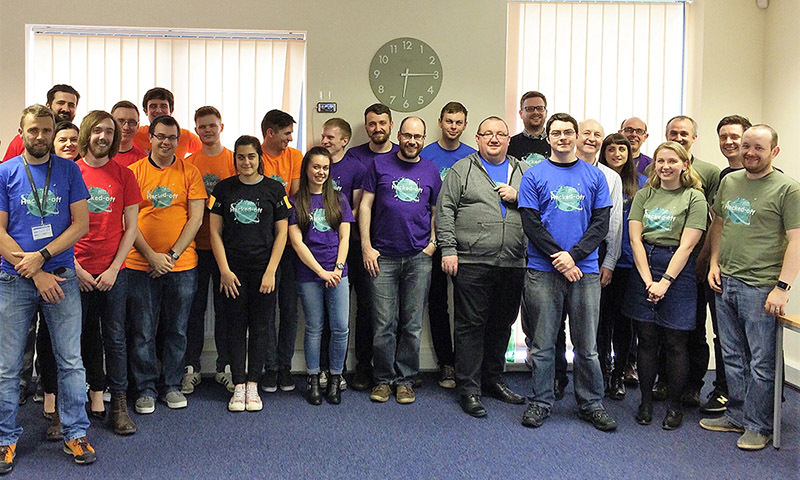 Our Bespoke developers divided into teams and each worked with a customer on their challenge with a view to sharing with the company what they’d managed to achieve by the end of the day – over beers and pizza of course. One of our customers Peter Allen, a Senior Teaching Fellow at Durham University Business School wanted to explore ways in which he could improve student input into the workshops he ran. He also wanted to see if there was a way in which he could improve how class discussions could be reported and amended and to more easily facilitate whole group discussions for online programmes. Peter wanted to explore a ‘design thinking’ methodology based on the workshop approach he took with students to develop business models and business plans, using Post-IT notes and wall mounted charts of the business model canvas. For the preparation work, presenting the materials using Microsoft Sway – a mobile friendly tool for creating engaging content was to be investigated. For the canvas, we decided to build a custom web application. This web application would allow people on different devices to collaborate on a business model canvas in real time so they could see each other’s notes and changes. There would be a different canvas for each teaching group and Peter would be able to pull up each canvas so that it appeared on a big screen for discussion. We also felt that the ability to ‘replay’ how the canvas was created would be valuable so the thought processes behind notes as they are added could be explored. Peter built up a sample Sway to explore how this might work whilst the Waterstons team worked on the TypeScript front end and the MVC back end. By the end of the day the team managed to get a proof of concept working where notes could be added to the board with updates being sent to everyone connected to the system. We also built it so that other tools such as the five forces framework could be easily added via additional configuration. Excitingly for us, Peter hopes to use the app in his workshops this academic year and potentially for engagement with other organisations. PWS are distributors of kitchen components and for the hack day, IT Manager Andrew Buckingham, wanted the team to focus on their bespoke worktop range. PWS wanted to be able to provide their customer with accurate real-time progress of their worktop order during the time they are waiting for it to arrive. They felt that this would help the customer feel engaged with the manufacturing process from slab of raw material to being fitted in the customer’s kitchen, and help the time to pass more quickly. Andrew previously set up an API with all of the manufacturing stages a slab of material can go through. We decided to have a starting stage which would show the customer information about their order. From the API Andrew created we were able to include a photograph of the slab which would eventually become the work surface. We thought this would be a good first stage to allow the customer to get an idea of how the slab looked and maybe think about how it would look when it was completed and fitted. We created a timeline which displayed the different stages in the order they should progress in, for example ‘cutting’ precedes ‘polishing’. The stages that a slab goes through differs for different orders, so we made sure any redundant stages could be hidden. Each stage could be in three different states – ‘Not started’, ‘In Progress’ and ‘Complete’. As some stages can happen in a slightly different order, if simultaneous work occurs for example, we wanted to indicate the states to the customer clearly. To do this we used small colour coded icons so that it was easy to see at a glance what was going on. So as the order progressed, the coloured icons would change accordingly. We used ASP.NET Core to create the main application, which is a significant redesign of ASP.NET and so we wanted to see how it worked. Specifically we were interested in one of the key features. This feature was that an ASP.NET Core application can be run on different platforms. So we wanted to test this by running our website on Linux. In the final few spare minutes of the day, we managed to get the website running on Linux too – hurray! We managed to cram a lot into the day and in the end came up with a working prototype we were able to demo. There is a lot that could be added to the timeline in future such as customer satisfaction surveys, warranty information or general feedback on the process. Reed Boardall is one of the leading temperature controlled food distribution businesses in the UK, operating 24/7 with a 180-strong fleet of state-of-the-art vehicles moving an average of 12,000 pallets of goods a day. Marcus Boardall, Deputy Chief Executive and Ian Edwards, IT Manager from Reed Boardall wanted to find a reliable way of tracking these pallets as they arrive and depart from the cold stores, use this information to direct the ped-operated fork lifts to the correct dock and to create a dashboard for the operational staff to provide real-time insights into the pallets’ movements. The pallets don't belong to Reed Boardall, so reusable tracking devices weren’t appropriate; the most accurate and cost-effective tracking would be via RFID. Radio Frequency Identification (RFID) uses tiny tags to identify objects when they pass through an electro-magnetic field. These tags are so small that they can be built into adhesive labels which could easily be attached to the pallets. RFID sensors could be installed around the dock and cold stores to allow the tracking of pallets as they move. The hack day budget didn’t stretch to buying a number of industrial-grade RFID sensors, due to their large price tag. Instead we looked for a solution using cheaper components that, while not suitable for deployment within Reed Boardall due to their very short range, were sufficient to prove the concept. The overall solution uses an event driven architecture. Events are disseminated between the components using Redis, a high performance data store and message broker, which supports both publish/subscribe and queue-based messaging. This would allow data to be transferred reliably between the various components of the solution. Marcus and Ian were tasked with using a Microsoft Power BI platform to produce a real-time dashboard. By defining the structure of the source data up front it allowed the hack team to develop both the software and dashboard simultaneously. The processed pallet movement events were published to the Power BI data source via the Power BI API. This allowed the entire dashboard solution to be developed without writing a single line of SQL! Marcus and Ian now have a proof of concept to take back to Reed Boardall and further investigation into the operational costs of producing the solution are currently being looked into. Our final client’s identity, for the purposes of this article, I’m afraid must remain a secret. It’s safe to say that they are a distiller of alcoholic beverages, but we can’t say any more than that! So, Mr X, as s/he shall now be known, wanted to be able to log and monitor any issues that occur across a large manufacturing plant and site – anything from a leaking cask to a broken lightbulb. So the system we developed was geared towards the ability to record pertinent information using a mobile device. Mr X was also interested in learning more about the potential uses of Azure, so we focussed on the Windows Azure Service Bus Tool, a cloud message queuing service which we used to relay the user-input information collected from the applications front-end of the final storage mechanism. HTML with Typescript drove the user-facing form. This coupled with Angular provided a mechanism for a user to easily input data using a mobile device. Once the messages were on the Azure queue they were ready for retrieval by a console application that processed them for storage in a SQL database. The solution could be extended for offline use, so it would hold off posting messages until an internet connection becomes available, useful for touring areas with little or no mobile signal. Again, by the end of the day we were able to come up with a working proof of concept. Something for Mr X to take back to Top Secret HQ to give them some ideas on potential future areas of development. It’s safe to say, all the clients who took part in this exercise thoroughly enjoyed their day. It gave our customers an insight not only into new technologies but also how a group of like-minded people can pull together on an unfamiliar project to share knowledge and produce a working prototype. If we may though, we’ll leave the final words to Andrew at PWS to sum up how he felt the day had gone, “The Hack Day was a revelation for me. To see such an effective team, all bringing their distinct skills and approaches together was fascinating and informative in equal measures. Not to mention that the final product was fully-functioning and showed potential for a genuine business benefit”. A look at the key announcements following Microsoft's unveiling of the new vision and roadmap for SharePoint at a major virtual launch event this week.